Red Barrels deliver brown pants in its first-person horror sequel. Outlast II is a spiritual sequel to the original, set in the same universe but with a new location and protagonists. You play as the cameraman half of a husband and wife team of journalists, trying to investigate the murder of a mysterious pregnant woman. Following a helicopter crash at night in the Arizona desert you wake to find your wife missing, after which things get only get worse. Using your camcorder’s night vision, you make your way to a sinister farmstead, inside which you uncover inverted crosses, mutilated corpses, evidence of strange rituals and more a bunch of other tropey stuff. There’s a distinctly Southwestern flavour to the horror here, which immediately recalls movies like Texas Chainsaw Massacre, The Hills Have Eyes and Children of the Corn. 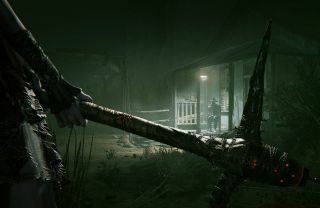 What’s likely to make Outlast II stand out from the rest of the horror pack, though, is how adept the developers are at stage managing their scares. Even in this short demo the tension is expertly ratcheted up on multiple occasions, using visual cues and bluffs to keep the player’s attention moving and nerves shredded. As ever, it’s the half-glimpsed stuff which is most effective. Early on, I spot a figure at the end of a long corridor—bald, menacing, clutching something—but can barely make him out. As I raise the camera to zoom in for a better look he recedes into the shadows. Later, in a section set in a school, I glimpse what looks like a girl dash past a window. I peek around the corner, the lights glitch, and when they come back she’s hanging from the ceiling. As I get closer something with a tentacle yanks her body out of sight. The sound design, as with the first game, is also exceptional. Your progress is punctuated by deranged laughter and the shifting, desperate cries of your wife. The effect is one of being on a ghost train, rattling from one set piece to the next. I actually found myself trying to move quicker, and being more reckless, because I wanted the whole thing over. Usually at E3 that’s because the game’s bad. Here, it was because Red Barrels is very good at what it does. Where the game doesn’t quite work is during the moments when you’re being pursued. The main enemies in the demo are hillbilly cultists who chase you around cornfields with torches and farm implements. Hiding in barrels whilst waiting for them to move on isn’t much fun, and being caught and chopped into chunks even less so. I mean, I get that those things aren’t supposed to be fun, but between the clunky movement and the punishing stamina system (which prevents you from sprinting for more than a few seconds), these sections feel unrefined versus the tense exploration. I’d love to play a horror game that really captured how pursuit encounters work in cinema, with the victim able to improvise and turn the tables. I was told Outlast 2 will be out this fall, though it sounded like that could potentially slip until winter. Hopefully there’s some extra depth to the action in the final version, because those more carefully-manicured horror moments are handled so masterfully. Or to put it another way: there’s almost no way I’m going to be able to handle this.